featuring both iNSIDE EUROPE and iNCANTATO CONCERT TOURS experiences in the past. Photo/video quality represents the standard of the time taken. 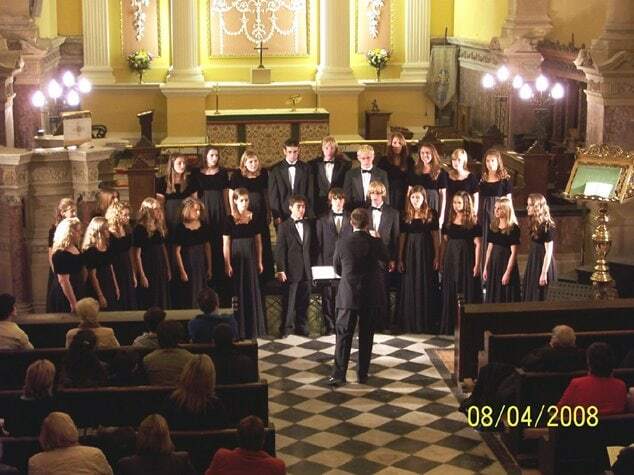 The San Clemente High School Choirs directed by Dr. Phil Theodorou gave a joint concert with the De La Salle Senior Boys Choir at Christchurch Cathedral iN Waterford, Ireland as part of their 2008 iNCANTATO CONCERT TOURS experience. The audience listened to traditional Irish pieces, madrigals, church chorales, pop and brand new compositions and paid tribute to the young musicians with enthusiastic applause. 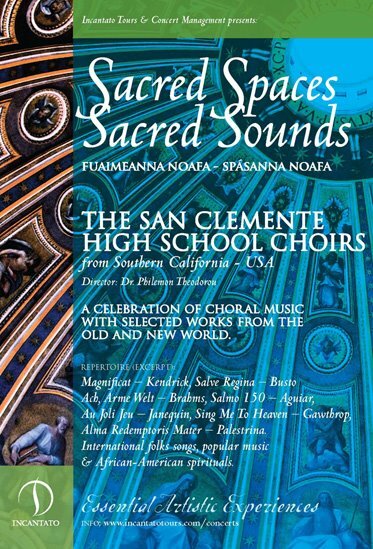 The 2008 Performance Tour to Ireland for the San Clemente High School Choirs lead by Dr. Philemon Theodorou featured an all a cappella touring program titled “Sacred Sounds – Sacred Spaces” (in Gaelic “Fuaimeanna Noafa – Spasanna Noafa”) with sacred works from Brahms, Palestrina, Busto, Aguiar, Gathrow and other European, as well as American, composers. 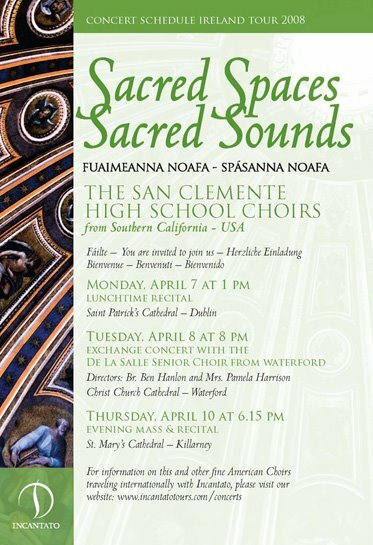 Their three formal concerts took place in Dublin, Waterford and Killarney and were advertised with custom-designed posters and a special concert postcard. The lunchtime recital at St. Patrick’s Cathedral was one of if not the highlight of the musical experiences.